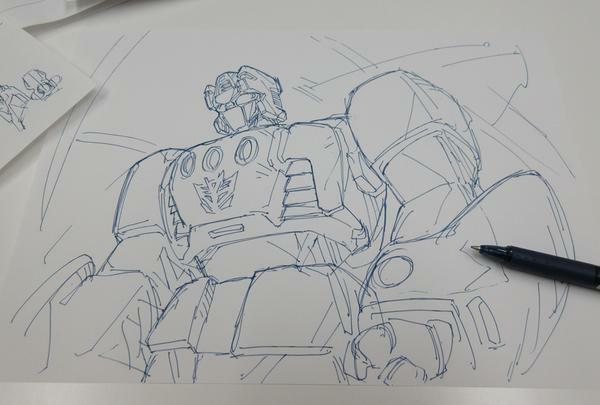 Home » Japanese Transformers » Hisashi Yuki Teases Possible Unite Warriors Blast Off? Hisashi Yuki Teases Possible Unite Warriors Blast Off? The G1 early anime decision draft, what with toys and subtle design is the difference? I think that guy but have nothing body, and Disclose the old material, but as often toy NG design and preliminary prototype is made to the original. Design work when you remake a guy of this hand we need to be careful with a variety! So although nothing is still concrete and we have to take this as just a tease for now, this is still very good news for fans to speculate about and hold out hope for! Check out the new image after the jump and speculate away! Why did this thread need bumped when they other one was sufficient in containing the discussion? Hm, I think I may end up swapping some of the UW Bruticus limbs. From what I get the part that pissed people off is the lack of a character specific head, that people who are otherwise receptive towards the new members didn't like cuz it was just a straight up Slingshot repaint. Hit the nail… on the… head. No. The people pissed about CW Blast Off would be just as pissed off, if not more. As demonstrated by what happened with Alpha Bravo/Offroad/Rook. Because one way or another they'd be mad it wasn't a shuttle named Blast-Off. From what I get the part that pissed people off is the lack of a character specific head, that people who are otherwise receptive towards the new members didn't like cuz it was just a straight up Slingshot repaint. If he was just a new guy instead of Blast Off I don't think the head thing would nearly be as much of an issue. Do we know if they're going to give blastoff a new bio? If "Blastoff" was "Take-Off" or whatever people like to call him nowadays I don't think people would be nearly as pissed off as they are now. Preordered. I've been getting all the UW box sets, good stuff. Was already expecting a shuttle, but even with that small pic… seeing Blast Off without that lazy Slingshot head brings a smile to my face. They should have renamed him Take off, because, that's what a Jet does. Space vehicles Blast off. Many around here have, including myself. The child in me also wants him to sound like Dave Thomas. Damned if you do, damned if you don't I think. No matter Hasbro called the brown Aerialbot, some section of fans was going to be unhappy. My stand-in Bruticus will be my FOC Bruticus w/ the Boosticus upgrade until I get my UW Takara Bruticus. Hasbro got me to buy FOC Bruticus. I'll give Takara my money for a proper Bruticus. I don't give a damn what people call it – CW "Blast Off" to me is "Sir Blastington of Take-Offshire" and nobody can stop me. Makes sense when you explain it! But that doesn't make sense either. Hasbro was COMMITTED to pushing new members as they wanted to foster a new generation of fiction for kids rather than pushing G1. THey didn't give a damn what people thought about Alpha Bravo, Off Road or Rook. That was what their plan was and for the most part they stuck with it. If "Blastoff" was "Take-Off" or whatever people like to call him nowadays I don't think people would be nearly as pissed off as they are now. Because they got enough complaints about new members Alpha Bravo/Offroad/Rook that they decided to keep the Blast-Off anme as part of the team at retail. That sounds odd since Hasbro never responds to feedback that quickly. Watching this video nearly gave me a panic attack. Not not really blasting off but it does go straight up once it hit the end of the runway. What does that make people like you who whine about people whining about whining?